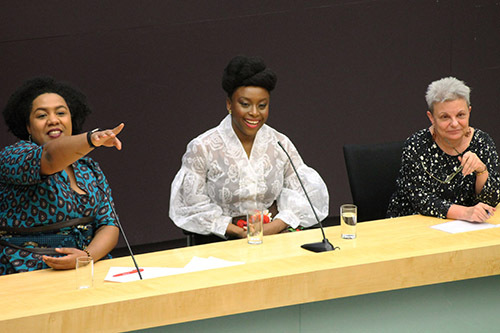 The acclaimed author Chimamanda Ngozi Adichie spoke at a public event at City, University of London that was held to launch the institution's new Department of English. Adichie discussed a wide range of topics in a conversation with City lecturer Dr Louisa Egbunike in front of a packed audience in the Oliver Thompson Lecture Theatre. The Nigerian writer is known for her award-winning novels, including Half of a Yellow Sun and Purple Hibiscus, short-stories, essays and non-fiction work. Her TED Talk, The Danger of a Single Story, is one of the most watched TED Talks of all time.